This is my favourite scenario so far. Played it twice, both times as the Romans. Got smashed in the first one, but won the second convincingly. 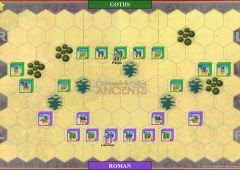 The Romans have to get the infantry into line as soon as possible and position their leaders for maxium effect, then let the Germans smash themselves against the wall of troops. Need to watch the left flank though, those medium cavalry can be nasty. Let them come to you, don't go after them, but do not leave the medium infantry to protect the flank, they need to be in the middle. 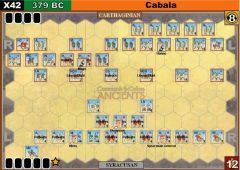 Use the archers and the Roman medium cavalry. 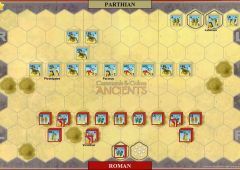 This scenario was the second part of our "Battle of the Barbarians" day that saw six games featuring Romans V Barabarians. This is really a fun scenario, see my comments above. Last edit: 8 years 1 month ago by King-Billy. One of my favorite scenarios as well. Just played it as the Romans and won by quite a margin. The strategy that Billy suggests worked extremely well. 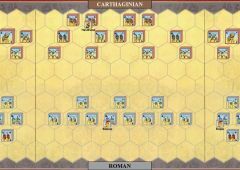 Romans, it is very important to get your infantry into a line and keep them in a line as much as possible. I got my medium infantry in the center, up front and in a line and they were able to repel attacks by infantry and warriors as well. Took losses but none that eliminated a unit. 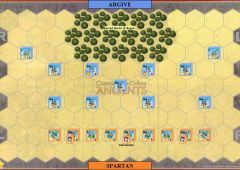 I let Sulla on the right flank range out on his own to take on the archers and harrass that side of the battle field. Seemed to work well. Agree with Bill about the Medium cavalry on the left. Don't go after them. They are pretty much neutralized when they have to attack units in any kind of line. Now to see if the Germans have it in them to win this one. According to Billy, it looks like it's possible. Looking forward to posting my strategy for a German win. Last edit: 8 years 9 months ago by Pavlov. Played this one on the same day as King Billy as the Romans (won it 8-5). Let the Barbarian Med cav hit me on the left, it took out my bowmen but a counter with my own cav forced some losses on the Germans and they retreated. 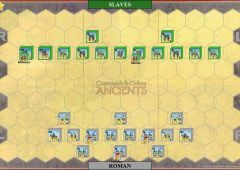 While this was going on I got the Roman infantry into a line in the centre and on the right. Moved them slowly forward fending off assaults by warriors and taking out some German auxilia. 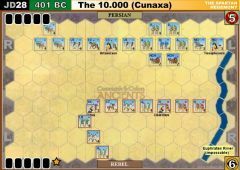 Picking off the auxilia proved to be the path to victory after repelling the warrior charges and forcing losses (and acquiring banners) on them. I agree that this is a good scenario where both sides have a good chance of winning. Happy to play it again. Germans have a tough time with this one.. I think the secret for the Germans is to use the Warrior advantages to full effect. Warriors can move two hexes if they then battle. Warriors that are full strength at the beginning of the turn attack with four dice. Full strength Warriors may ignore one flag result. A warrior unit may make a momentum advance and bonus combat even without a leader. Thus a full strength warrior can in many instances attack with 8 dice per turn. This is particularly powerful if you get warriors next to each other next to an enemy line. If the first one does not kill it, it will hopefully damage it enough for the second one to kill it. It will then advance and attack the next enemy in the line, hopefully weakening it enough so that the next warrior can kill it and advance, repeat as many times as you have warriors. 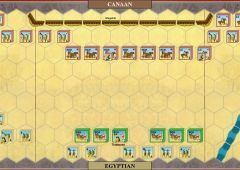 I think in this game it would even be of benefit for the leader with the medium cavalry to abandon the cavalry and join a warrior unit. A warrior supported by a leader will get a kill on 50% of each roll. Space the leaders out so that each warrior is supported. It is harder on the Germans, but can be won. Played this solo, German win 8:2 in 10 turns. A reversal of the historical path, the German hand opened with a Mounted Charge and two cards for right flank movement, which lead to effective use of the medium cavalry to roll up part of the Roman left and then come across to harry Roman centre units as the Germans managed with line advances and similar to break through between the Roman centre and right. So perhaps now the seeds of the civil war are not Marius and Sulla disputing credit for victory but instead blame for loss. 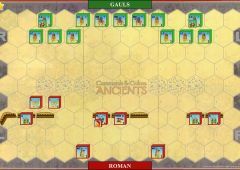 We played three battles; Gauls won two, Romans one. First battle, the deciding factor was warrior charge breaking the center Roman line and getting behind Roman lines plus cavalry charge on Gaul right flank. 8-5 for Gauls. Second battle, Gauls tried the same strategy but were decimated. Gaul player had some unfortunate cards, severely hindering his strategy. 8-5 for Romans. Third game, another Gaul victory. 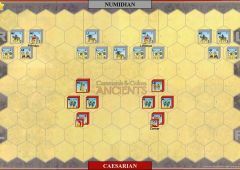 First strike and two Line Command cards brought the advantage to Gauls which they managed to explore mopping up damaged Roman units. 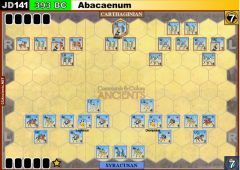 8-3 (or 8-4, I forgot), but the game was very close - if Romans managed to pull back injured units it could've ended quite differently.